D-Link has launched their next generation ShareCenter Network Storage solutions which are appropriate for every current digital home, providing centralized storage and enabling consumers to easily share documents, files and digital media with everyone on a home network. 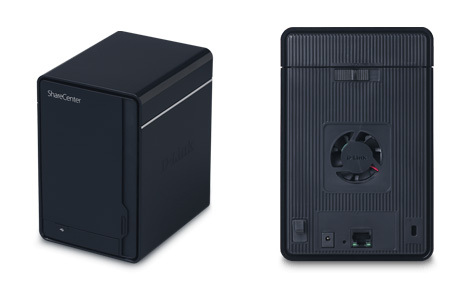 The new ShareCenter 2-Bay Network Storage devices, the DNS-320 and DNS-325 feature two SATA HD bays for 3.5-inch drives of either 1TB or 2TB capacities and are expandable if you need more storage space. They support Windows, Mac and Linux computers, offer intuitive user interface, have built-in Web File server and FTP server for easy access of important documents remotely, over the Internet. Other features include built-in Peer-to-Peer (P2P) downloader for downloading digital media from share sites without having to power on or connect your PC, Photo Center App for sharing photos over the Internet, streaming of movies and audio to your TV using the Boxee Box or any other compatible media player, such as the PlayStation 3 or Microsoft XBox 360, and even a Blog application that allows users to host their own blogs directly from the device. The DNS-320 is equipped with 800 MHz processor, while the DNS-325 has 1.2 GHz processor, they allowmultiple hard drive configurations such as RAID 0, RAID 1, Standard, and JBOD, Gigabit Ethernet, also both have USB port for easy sharing of printers among all of the computers in a household over the network, and come with Farstone’s Total Recovery Pro Backup software. The DNS-320 and DNS-325 are available now for $109.99 and $199.99, respectively, in addition, D-Link will also launch the DSN-320-110 and DNS-325-110 (pre-configured with a 1TB disk drive) in May 2011 for $199.99 and $279.99, respectively.